Hello, I'm Gregor and I put this site together. 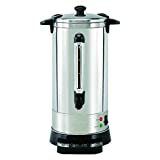 At first, you'll find an overview of recommended coffee urns, followed by a public poll and a general buying guide on coffee urn. Further down on this page, we do link to other well-written articles and reviews about coffee urns. At last, you'll be able to weight in your own opinion in the comments section. 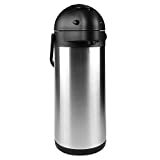 If you also want to vote on the best coffee urn, click here to view the poll. 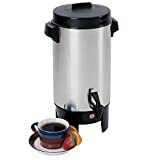 Coffee urns are commercial coffee makers that allow you to brew large amounts of coffee at once. The urn may also hold your coffee warm, allowing you to dispense one cup at a time without worrying that it will burn or get cold. 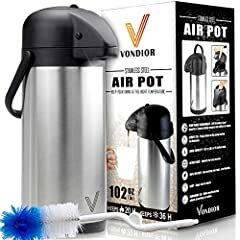 This is an essential tool for all restaurants, hotels, catering companies and other businesses that serve coffee to guests. There are some circumstances that justify the investment for residential settings as well. If you depend on coffee to make it through the day, there's a chance that an urn has its place in your life. 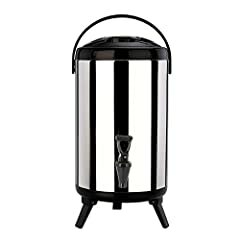 Do You Need a Coffee Urn? Most people invest in an urn when they get tired of making coffee in a smaller machine multiple times a day. 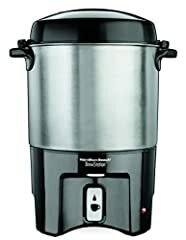 This is a waste of time when you can purchase a coffee urn to do the work for you, holding your coffee warm until you're ready for the next cup. You serve coffee to multiple people throughout the day. An urn will free you from making a fresh pot of coffee each time it's needed. Brew at the start of the day and forget about it. You want to offer fresh coffee to your employees to keep them alert during the day, but you don't want them wasting time on a standard coffee maker. You have a waiting room and would like to offer fresh coffee to your customers. This makes waiting more enjoyable, and you may get fewer questions about the wait time. You have a food service company, and you want to ensure that fresh coffee is always available without wait. You like to entertain in your home. Whether it's an intimate dinner party for 10 or a raging Halloween bash for 50, having fresh coffee on hand for your guests is essential. You have enough to do as the host, so take keeping the coffee fresh off your to-do list. You consume a lot of coffee throughout the day but don't necessarily have time to make a fresh pot. Fresh coffee on demand sounds like a dream come true, but it's possible if you invest in a small urn. 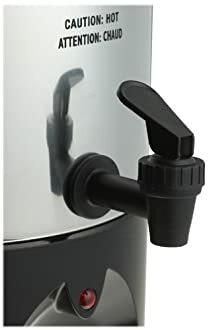 Keep in mind that many restaurants and catering services use coffee urns to hold hot water. They can pour the water into a cup to make tea, giving guests another drink option. If you plan on doing this, you will need one urn for coffee and one for hot water. 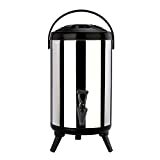 Coffee urns come in different sizes and have a variety of features that you may or may not use. This buying guide will help you decide what type of urn best fits your needs and which features you should look for when shopping. 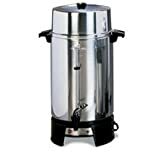 Are you confused by the coffee urn market? You now have more options than ever before, and it's important to select the right type of machine for your needs. Use this list as a cheat sheet to determine your ideal coffee urn type. 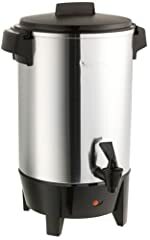 High-Volume Coffee Urns – These are the large urns that are used by restaurants and other businesses serving large crowds. Some are electronic while others are powered by propane or natural gas, so pay close attention when selecting an urn for your establishment. These urns are designed to brew the coffee and then hold it at a specified temperature for an extended period of time. 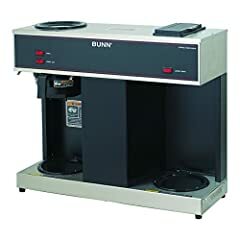 They typically range from 3 to 40 gallons, and you can buy double or triple units that allow you to brew even more coffee at one time. Coffee Chafer Urns – These urns have a more traditional look when compared to standard coffee urns, and they always use an external heat source. 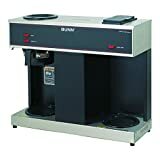 They're designed to brew coffee and then keep it hot, but they may not keep it to a specific temperature consistently. If you're looking for decorative lids or colors other than stainless steel, you're probably looking for a chafer urn. Sizes start around 1.5 gallons and typically go no higher than 6 gallons. Electric Coffee Urns – These are the modern coffee urns that you plug into a wall outlet, and they're the most convenient type for most businesses and homes. They start around 30 cups and can go up to 110 cups or maybe a bit more. They may come with some advanced digital features that you won't get with other types of coffee urns. How big do you need to go? This is one of the most common questions asked by first-time coffee urn buyers. You want to make sure that you have the capacity to meet the needs of your guests, but you don't want to pay for an urn that is too big for your needs. The solution is to estimate the maximum size of your expected crowd and assume about 1.5 cups of coffee per person. This is a general rule that assumes some people will want more than one cup of coffee while others won't want any. It's also important to think about portability. 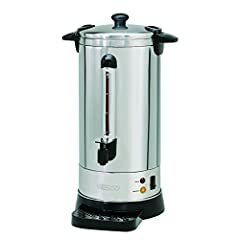 You may use one urn in your home or as a stationary machine in a restaurant while selecting an entirely different unit for a catering company. If you need to bring the urn to different locations to serve at weddings, parties and other events, make sure that the unit is manageable in the moving process. Electric and high-volume coffee earns are typically left in a dedicated position. Smaller chafer urns with decorative features are often more portable, and they look great when sitting in an open serving area with guest access. If you need a higher capacity than a chafer urn can provide, consider investing in multiple units. While coffee urns are tools of convenience, they do require some prep time. You will need to start brewing the coffee at least an hour before your expected serve time. If you want more precision to the process, determine how many cups of coffee you're brewing and multiple by 40 seconds. This is the average time that it takes for an urn to brew one cup of coffee, but you may find that your urn is a bit faster or slower once you start using it regularly. If you want to set your urn out in a waiting room or for your employees to use throughout the day, assign one person to get the brew on at the beginning of each day. Make sure that they go back to the urn about 30 minutes after it stops brewing to remove the basket with used coffee grounds. This will prevent the coffee from tasting burnt if it's not consumed right away. Expect to refill your urn about every two hours if it's left out for independent use. This is where selecting the appropriate size is important because you don't want to make more than your guests will consume in that period of time. You can always fill a large urn partway if needed, so don't make 100 cups if it's not needed. 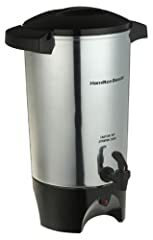 Every coffee urn operates a bit differently, so make sure to read the instructions before using it the first time. This will spare you from burnt coffee and other mishaps that are easy to avoid by simply following directions. New: Our editorial list of additional articles. We decided to gather informartion all around the internet and present you a list of helpful, external links to interesting reads about the best coffee urns and their reviews and guides. You're not convinced by the previous writings about coffee urns? Of course you can just choose by visual impression, that's why we present you all our chosen products at a single glance. A click on any image is enough to open an external link to the best offer we could find. 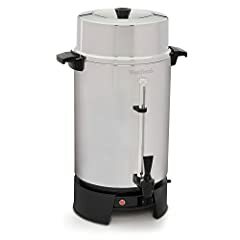 Finally, we want to present you our rating criteria for our coffee urn comparison, so you can better understand and comprehend our recommendations and the rating process itself. 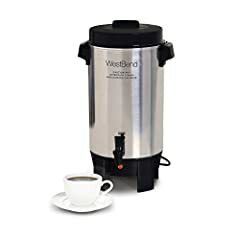 Furthermore, we still ask you to keep your eyes open for short term deals in order to make some great bargains with coffee urn in 2019. Published by G. Krambs on StrawPoll.com (last update on 2019-04-18 08:36:13). 38 of 51 readers found this article helpful.